Phil Keed has spoken for the first time since joining Irwin Racing as race engineer to Mark Winterbottom for the coming Virgin Australia Supercars Championship campaign. Former race engineer to Fabian Coulthard at DJR Team Penske and Brad Jones Racing, Keed was recruited to the Charlie Schwerkolt-owned squad in the latter part of 2018. Keed has previously worked alongside Winterbottom when the pair were at Ford Performance Racing, now known as Tickford Racing. 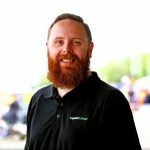 He’s one of a number of changes at the single car team that has also seen the arrival of Steve Henderson as technical director. The squad will also boast a technical alliance with Triple Eight, and purchased a new chassis from the powerhouse team which it took delivery of at Queensland Raceway last week. Schwerkolt told Speedcafe.com last week that he was confident the appointments of Keed, Henderson, and the Triple Eight relationship, would pay dividends. “I am so excited to work with Charlie and the team, I met everybody at the end of 2018 and was really impressed with the calibre of people that Charlie has built up over the last few years,” said Keed. “I’ve worked with Frosty before and know what a fantastic driver he is. He’s a perfect fit for this team and the new challenge will bring out the best in him for sure. Henderson returns to the main game after working in Australian GT and Super2 in recent seasons, though prior to that engineered Steven Richards and Greg Murphy from 2000 to 2008. “I’m really looking forward to the 2019 season, Charlie has assembled a fantastic team with the best equipment,” Henderson said of the upcoming year. Irwin Racing is yet to official unveil its 2019 challenger, or announce Winterbottom’s co-driver for the Pirtek Enduro Cup although it is believed Steven Richards has secured the role. The 2019 season begins in Adelaide at the Superloop 500 on February 28.